The study was conducted at three polluted areas; one at El Nubaria Canal in Alexandria, and two in the River Nile at El Tebbin and Helwan. The industrial residues of petrochemicals, iron and steel, as well as starch and glucose pollute these areas respectively. During the study, the samples were collected six times at El Nubaria Canal and seven times at El Tebbin and Helwan. The data were codified to express the seasonal changes. Three stations represented the area of El Nubaria Canal and four in River Nile; two at El Tebbin and two at Helwan.The results of the total zooplankton abundance showed high density in the areas before pollution than at the mixing points. This observation was pronounced at petrochemical residues more obviously than that of steel and iron as well as starch and glucose factories. 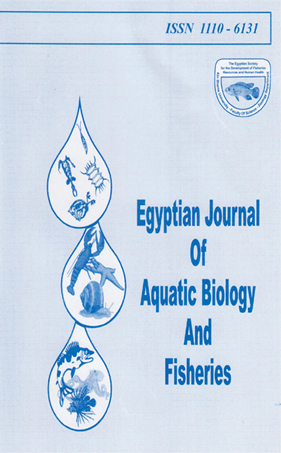 The major taxa were represented by 14 species of Rotifera, 5 Cladocera, and 4 Copepoda at El Nubaria Canal, whereas in River Nile at El Tebine and Helwan, they were represented by 37 Rotifera, 8 Cladocera, and 3 Copepoda.The diversity of Rotifera was the highest in the River Nile. Keratella cochlearis and Brachionus calyciflorus dominated the rotifers community. Cladocera was dominated, by Bosmina longirostris, whereas Copepoda was dominated by Nitocra lacustris at El Nubaria Canal and by Thermocyclops hyatinus at the River Nile.The maximum density of zooplankton organisms was recorded at the area before the pollution especially at El Nubaria Canal. Winter and autumn were the best seasons for zooplankton flourishing in El Nubaria Canal, whereas in the River Nile, winter and summer displayed the peaks of the zooplankton density.